Every trader needs a trade entry system. In chapter 3 we covered the first fundamental step of trading, that is, to choose the market in which you want to trade. But, within each market, there is a plethora of trading opportunities to choose from ? I call this the universe of securities. So how do you choose from this vast universe? Simple. Predefine your entry rules. Trade entry rules are a stringent set of conditions that you develop, document and then apply, to decide when you are going to enter a trade. It doesn?t matter what securities you?re trading, you just need a consistent method of entry. Like sifting through a bucket of sand trying to find pieces of gold, the same approach is used to reduce your universe of securities to a shortlist of those that meet your criteria. As in all aspects of trading, there are many theories on trade entry and how to exit trades. I believe the best way to approach entries should be simple, direct and leave nothing to human judgement. This is contrary to the philosophy of many traders who buy stocks based on media reports, ?expert? opinion, rumours and/or gut feel. The good news is that by acting contrarily, you will do what most traders never do? make a profit. I spent a lot of time in chapter 3 telling you why you shouldn?t copycat someone else?s system, but that?s not to say you can?t take elements of a proven trading plan and stitch them together into something that will suit your personality. Let?s revisit the example of Richard Dennis and his Turtles. Dennis? prot?g?s were successful because they were under his direction at all times. Every trade was heavily scrutinised and made according to his strict rules. The students had to follow these rules or be dropped from the project. The fear of loss forced the traders to follow the system no matter what. In the real world, most people would not have the discipline to do this. And nor should they; it wasn?t designed for them. Furthermore, the Turtles were trading with someone else?s money. When it?s your own money on the table, you need to be completely comfortable with the decisions you make, and you can?t do that unless your system suits your personality. Dennis? students went on to become successful traders in their own right because they learnt discipline from their mentor, not because they continued to trade his system out of the box. They adapted it to suit themselves. And that?s what you should do. Think of it this way: how many people do you know who have stayed in a job or field of work just because it?s what they?re used to? They may not love it, but they persist just the same.Maybe you?re one of those people. But, while these people might be able to do that job with their eyes closed, they will never excel at it if they?re not passionate about it. Their heart needs to be in it. Trading is the same. If you?re not 100% behind your trading system, chances are you won?t be able to stick to it, and if you can?t stick to your system, you will never reap the benefits you are hoping for. Most traders believe the key to success is being able to pick the bottom of the market. This is why 99% of traders spend most of their time fidgeting with the entry; they are looking for that elusive secret, That one setup that will ensure ongoing success. But let me tell you from experience ? that setup rule doesn?t exist. And, in actual fact, it?s not that important. Spending countless hours optimising your trade entry rules, trying to find that ?perfect? indicator, can actually do more harm than good. Over optimisation based on historical data actually decreases the profitability of your trading system when trading in real-time. Typically, the more you optimise, the less robust your system tends to be. Remember Tharp?s chart? (refer to chapter 2). He said that the trading system, which includes your trade entry rules, accounts for only 10% of what it takes to be a successful trader. That means, there is another 90% of ?stuff? you should be concentrating on, such as money management (discussed in chapter 6). Amazingly, a system can have a very random entry signal and still be profitable as long as money management is in place.? Take the following real-life example from Tharp. Tom Basso designed a simple, random-entry trading system ? We determined the volatility of the market by a 10-day exponential moving average of the average true range. Our initial stop was three times that volatility reading. Once entry occurred by a coin flip, the same three-times-volatility stop was trailed from the close. However, the stop could only move in our favor. Thus, the stop moved closer whenever the markets moved in our favor or whenever volatility shrank. We also used a 1% risk model for our position-sizing system? We ran it on 10 markets. And it was always, in each market, either long or short depending upon a coin flip… It made money 100% of the time when a simple 1% risk money management system was added… The system had a [trade success] reliability of 38%, which is about average for a trend-following system. Although a little convoluted in its explanation, this example illustrates that an entry strategy as simple as a coin toss can turn solid profits.Most traders spin their wheels trying to get in at the ?best? price, even though this is not where the money is made. So what?s the take-home rule here? It is easier to copycat your way to success than to try to re-invent the wheel. According to Anthony Robbins, the way to become as healthy as possible? is to find the healthiest person you know, ask them how they do it and copy them. Similarly, the way to select your trade entry rules is to find the best, proven entry system you can for your selected market and model your entry on that system..Sure, you can waste months and spend thousands of dollars testing different methods, but why put yourself through that? Would you rather be a wealthy copycat or a broke trailblazer? Trading is one of the few industries where people actively share their methods. In other areas of business, people tend to keep their success secrets to themselves; in trading, there are innumerable proven systems and models out there that you can access. Admittedly, you have to pay for most of them, but they are readily available. So now you have two choices: you can design your own trade entry rules (which includes appropriate back testing) or you can apply a ready-made entry system, confident that someone else has done all the hard work for you. The better choice seems obvious to me, but I?m not here to make your decisions for you. I?m here to pass on as much information as I can and help set you on a course that will suit your situation. Let?s look at these in more detail. The cornerstone of technical analysis is the trend. Remember ?the trend is your friend? and you always want to trade with it, not against it. I believe this to be the most critical component of any trade entry system. You need a way to measure the trend. There are many ways to identify trends, and as with most things in trading, there?s more than one way to skin a cat. The key is to have a method in place.One of my preferred methods for identifying trending securities is to find securities trading at their recent highs.That is to say, the highest high price must have been achieved in the past x number of days (where x is the variable depending on the timeframe you are trading). The longer the timeframe, typically the higher the variable. If I were to trade a medium to longer term approach I might want the highest high price in the past 200 days to have occurred in the past 20 days.I use a charting package called MetaStock (covered in more detail in chapter 8). Liquidity is an important determinant because you want to be trading securities that you can buy and sell quickly and without moving the market.You never want to be caught in a position where you want out but there?s no one to buy. With liquid instruments, such as the forex market that trades billions of dollars each day, trades are happening constantly, so your activity alone will not move the market. In short, avoid illiquid securities. The 21-day average of volume multiplied by the closing price be greater than $400,000. Volatility is simply a measurement of how much a security moves. Not whether it goes up or down, just how much it fluctuates.It is important to trade securities that move enough for you to make a profit. Of course you don?t want securities that are so volatile you can?t get to sleep at night. On the other hand, you don?t want something that moves at such a snail?s pace that it is not delivering the returns you are after.One of my favourite ways to identify volatility is using the ATR method, which indicates how much a security will move, on average, over a certain period. Here?s how I might use this method. A $10 security might have moved fifty cents per day on average over the past 21 days. I can simply divide this value by the price of the security to calculate the average percentage movement of a security over the past 21 days. With this value, I can stipulate a minimum and maximum volatility value. If I were a reasonably conservative trader I might want a security to trade between a band of 1.5?6%. That is to say, I want the ATR divided by the average closing price, over the past 21 days, to be greater than 1.5% and less than 6%. Tip: A great place to start when researching your entry rules is to print out all the trading candidates you would have liked to have traded in the past. Next, mark on the charts themselves where you would have ideally liked to have entered. Finally, look for common characteristics among those entry points ? these similarities can form the basis of your entry rules. If you?ve decided adapting a ready-made and tested system is best ? I?ve done the hard work for you. I have hand-picked the best systems for your chosen market.These courses will not only educate you about the market you choose but they also provide you with the exact trade entry rules you need to include in your trading plan. Simply follow the link to your selected market. Finally, as with everything we do, it?s important to document your new trade entry rules. As I?ve said, a good set of entry rules are simple, direct and leave no room for human judgement.Take the trade entry rules discovered through your own research or from your selected program and write out exactly how you will enter a position.This simple act of documentation puts you among the top 10% of traders. If you have decided to develop your own system from scratch, plan your entry criteria making sure to do an appropriate amount of back testing ? documenting everything. Love your work Dave – I’ll be sure to send my subscribers to this website. As always, remember the trend is your friend. It is for a long time that i read every where “not to believe in all the dream’s sellers”. From your experience, is this “Nicolas Darvas Home Study Course + Bonuses” that promise a perfect trading system (even an automatic one…) is something true? Is it reliable? Is it something that after i’ll read it, i’ll be able to be a successful trader? Or after all that Home Study Course is like all other books that give you only some more theoretical aspect of trading and nothing more? Note: I’m a beginner in the trading world..
What do you meat by a 1% risk money management system? Do you mean you only risk 1% of your trading capital on any one trade or does it mean you set a stop 1% away from your entry? You’re stop on… 1% risk means that you only risk 1% of your trading capital on any one trade. For more info of this be sure to check out my http://www.trading-secrets-revealed.com course. No system is going to be the holy grail and magically turn you into a successful trader. It may provide some pieces to the puzzle but you must ultimately create your own trading methods. Sorry but I’m not too sure this is the answer you were looking for. I was just watching these introductions and I noticed that you provided links for different markets. These are casual links or you know them and recommend them? You’re safe to check out those programs… I have looked into them myself. Being simple as they are you still need a trading plan, thats reason I am on this site. One of the challenges I have come across is when reading articles about trading plan , is they hardly mention them. I would like to know whats your view on them? Thanks for your message and kind words. With regards to binary options… there’s really are hundreds of ways to be profitable in the market. I know we don’t really address them on this site, that doesn’t mean they’re not a viable option. Simply it’s important to focus and as such we couldn’t list ever possible market in our guide. As for my opinion, I personally haven’t traded them so I’m not really in a position to comment. I’ll find out more and report back. Thanks again. So iv been going through this course and gotta say its really exciting. Im a green novice wanna-be-trader. So now that iv reached this chapter iv decided to go and purchase a ready-made entry system for stocks. Do i stop your course on this chapter and go through all the training material that we get from Jim first before i continue with your next chapter? Thanks for your email and great to hear you’re geting started – that’s the biggest hurdle to overcome! As a general rule I think it’s best to complete each action step before moving on. It’s all too easy to say “yeah yeah… I’ll come back to it” and never do! (I know I’m guilty of this sometimes). Take action now and reap the rewards. I\’ve been looking at your videos and website and got really excited about it. Also looked at the links and it seems they divert me to other authors. Is it correct? Also I looked at your trading secrets revealed for $97 and your ultimate trading systems for $7. Are they two different things or purchasing one pretty much I would have the same concepts of the other and why the difference in price? Which one you recommend the best? I\’d like to trade forex. For some reason I just prefer it rather than stocks or other instrument. Thanks for your post. In answer to your questions, yes I do recommend other authors that can help you in your system development phase. That said, you replace those components with course material you might already have (if you’ve purchased some courses in the past). The key is to just have something in place for each area. As for my courses. 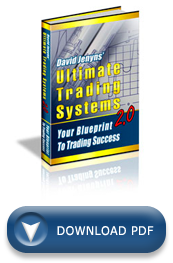 The Ultimate Trading Systems (for $7) is just the same course you’re reading online @ http://www.freetradingsystems.org... the only difference is you pay $7 so you have a downloadable/printable copy. And then there’s Trading Secrets Revealed, that course is focused on the most important component in any trading system – Money Management. If you haven’t yet got that sorted in your trading system it’s definitely worth getting. Anyway hope that helps, sounds like you’re on the right track, stick with it, the rewards are worth it. I have been trading on the CMC marketmaker platform for over 10 years and have recently developed an exciting, yet extremely simple, system on the AUDUSD & GBPUSD 1 hour chart – over the past 3 months of data (thats as far back as it goes). The system seems almost too good to be true and I wanted to backtest further to cover a greater range of market conditions. I have done all testing and optimisation manually and it is VERY time consuming to say the least. Do you have any advice as to what products or services that may be available for me to backtest further back. I am not looking for anything complex, rather a more simpler way to backtest automatically my simple system on the AUDUSD & GBPUSD. Cheers & God Bless you! Unfortunately there aren’t any really “simple” back testing products/services I know of… all of them require a bit to fully and confidently test. We use TradeSim (which is a plugin for MetaStock) and I’ve also heard good things about WealthLab. Sorry not too sure if that’s what you were hoping to hear. If I can help further let me know. I’ve enjoyed most of what I’ve read on this website. It is certainly true that entries must go with the trend….which is what the Darvas System did. However, I am disappointed to see you promoting someone’s idea of getting rich off Darvas. If people want to know HOW Darvas made money, they can simply buy his book on Amazon. And if they look carefully at the trades, they will realize that he was operating his system in the right place at the right time. Have you checked in with him lately? Has Darvas himself been able to duplicate that degree of success since writing the book? I think not. The ad for the Darvas “Piggyback” book makes it sound as if there IS a Holy Grail and you said it yourself……there isn’t. Hi, I’m a little confused. Earlier you say that good traders come up with their own systems to fit their personality so that they “own” it. This makes sense to me. But now you say to apply a redy made entry system. Which is it? Are you saying to borrow someone else’s system that fits the style that I’m most confortable with? Thanks for this site. It is very interesting. To be clear… you must design your own trading system and “own it” – that’s not to say that you can’t model your system on someone else’s – you just need to make enough changes that you can say its success or failure is your responsibility. @Fred – with all trading systems take their marketing with a grain of salt… I may not agree with the way they are marketed but that doesn’t mean that the methodology isn’t sound. My personal system is based on a variation of the Darvas method. Stick with it guys… you’re on the right track and the rewards are worth it. You have suggested trading systems for 4 out of the 5 markets mentioned in Episode 3 of freetradingsystems.org. What about cfd’s? Are there any trading systems for trading cfd’s? Does Jim Cox discuss how to trade short as well as long? Money management is where it’s at – not entries. Hope you learn this fact before you blow your trading float. Entries are important yes BUT give me smart stops and good trade management and I will eat you alive lets see who\’s account survives longer 1 100 pip hit and your dead no professional in their right mind would risk alot and i mean real professionals, yeah let me get the best entry and then let the trade go all over the place worst let it turn into a loser or leave money on the table, without trade management and risk control you will not survive in this game plain and simple go buy lotto tickets.